NMSU provides the NMSU community with AggieAir - WPA2 Encrypted wireless internet access, which can help protect sensitive personal information such as usernames, passwords, and credit card numbers from snoopers on a network. The service is available to any student, faculty, or staff with valid myNMSU credentials. If you have not registered your device to the University network please choose the appropriate link below and complete to necessary steps before you continue. Users are expected to use wireless access in a legal and responsible manner. By using the AggieAir-WPA2 wireless network service, you are agreeing to abide by all applicable local, state, and federal rules and regulations. You are also agreeing to abide by the policies set forth in the NMSU Policy Manual (http://manual.nmsu.edu/files/2013/10/06.24.15-NMSU-Policy-Manualprov-modif-3.pdf) including but not limited to 2.35.1.1.1 (Acceptable Use) and 2.35.1.2.3 (NMSU Institutional Data Security). 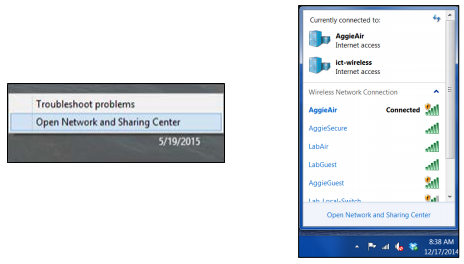 Misuse of the AggieAir-WPA2 wireless network will result in the loss of your Internet connection privileges. It may also result in your removal from university grounds and possible legal action. AggieAir-WPA2 wireless network provides the user an encrypted network connection, which can help protect sensitive personal information such as usernames, passwords, and credit card numbers from snoopers on a network. However, NMSU provides access to its AggieAir-WPA2 wireless network with no guarantees of speed, performance, security, malware, or privacy protection. Encrypted connections do not protect against viruses or malware. NMSU recommends that users of the AggieAir-WPA2 have up-to-date virus protection and security software running on their network-connected devices. NMSU is not responsible for any loss of any information, loss of data, hardware or software failures, or any damages resulting from the use of the AggieAir-WPA2 wireless service. By accessing and using AggieAir-WPA2 wireless Internet service, you agree that you 1) are a Student, Faculty, or Staff of the University with a legitimate university business and 2) have read, understand, and accept the Terms and Conditions of Use as outlined above. Windows Vista and 7: Right click on the wireless network icon in the taskbar. In the menu, click Open Network and Sharing Center. 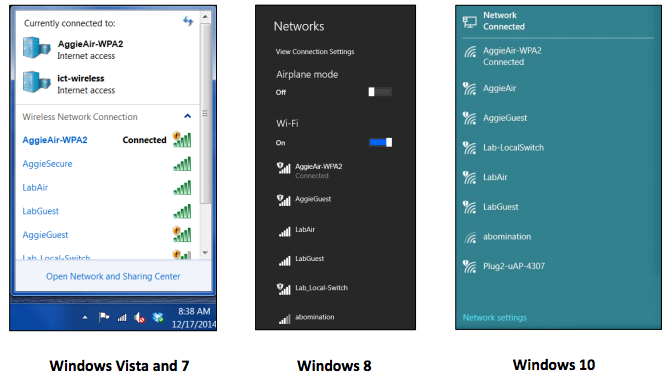 Note: You can also access your network connections by clicking Start > Control Panel > Network and Internet > Network and Sharing Center or by opening your list of available wifi connections in Windows Vista & 7 or by clicking Open Network and Sharing Center. 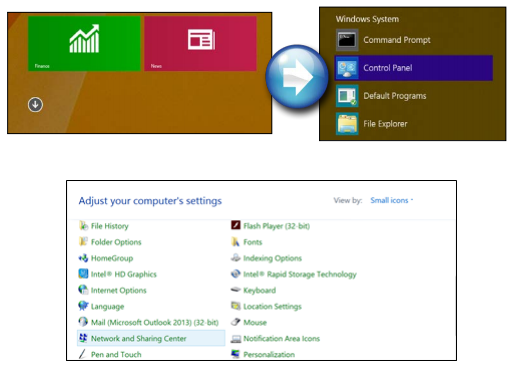 Option 1a - If you're using the default Windows 8 user interface (tiles), click on the down arrow to get to the app section. Then, click on Control Panel under Windows System. Next, select Small icons in the View by menu and click Network and Sharing Center. Continue to step 2. Option 1b - Alternatively, click on the Desktop tile. This will switch you to the classic Windows interface. Right-click on the wireless network icon in the taskbar. In the menu, click Open Network and Sharing Center. Continue to step 2. Option 1c - If you're already using the Windows 8 classic desktop interface, Right-click on the wireless network icon in the taskbar. In the menu, click Open Network and Sharing Center. Continue to step 2. 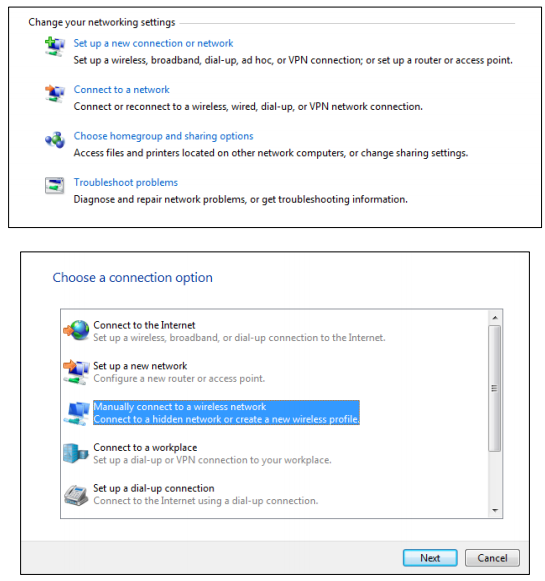 In the "Network and Sharing Center" window, click on Setup a new connection or network. Select Manually connect to a wireless network. Next, input the settings for the network. For Network name type AggieAir-WPA2. For Security type, select WPA2-Enterprise. The Encryption type should be AES. When you are done inputting the settings, click Next. The following window will say that you have successfully added AggieAir-WPA2. Click change connection settings. In the next window, click on the Security tab. Make sure "Security type" is WPA2-Enterprise. The"Encryption type" should be AES. 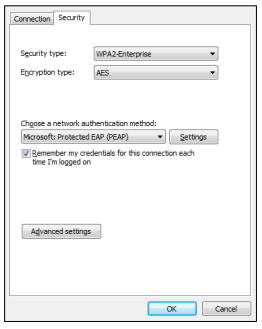 The "Network authentication method" should be Microsoft: Protection EAP (PEAP). Next, click the Settings button next to "Network authentication method". The next window will be the "Protected EAP Properties" window. Make sure the box labeled Validate server certificate is unchecked. 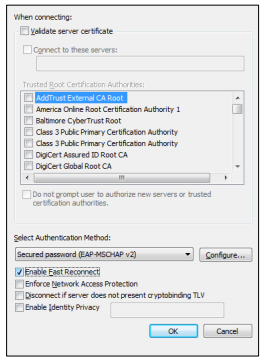 Under "Authentication Method", select Secured Password (EAP-MSCHAP v2). Next, click the Configure button under Authentication Method. Note: If you would like to, check the box for Enable Fast Reconnect. Doing this will not effect the stability of this process. In the next window, uncheck Automatically use my Windows logon name and password. Click OK in the "EAP MSCHAPv2 Properties" window and in the "Protected EAP Properties" window. Back in the "Network Properties" window, click Advanced Settings. Click on the 802.1X settings tab. 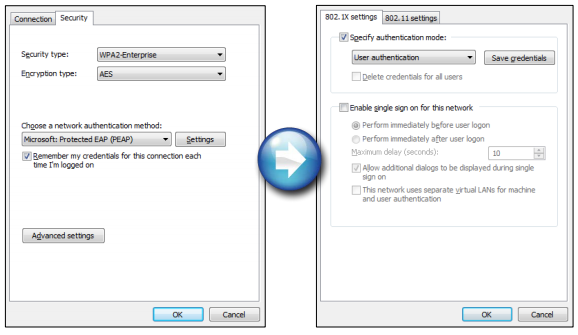 Check the box labeled Specify Authentication Mode. Select User Authentication from the drop-down menu. Now click OK. In the "Network Properties" window, click OK. Click the Close button in the "Successfully Connected" window. You will now be able to connect to the secured AggieAir-WPA2 internet. To log in, click the wireless network icon in the taskbar. 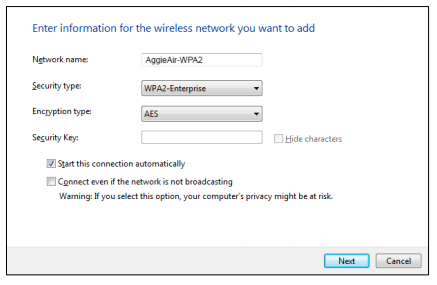 Select "AggieAir-WPA2" and click Connect. In the next box, enter your NMSU username and password and click OK.